It’s great to get paid for days off, but it’s even better to be paid for days that don’t exist. If you are a Samoan (not American Samoan, just Samoan) who was scheduled to work on December 30, 2011, you woke up on December 31, 2011 with a government promise of full pay for December 30th, without having worked or lived a minute of it—but not because it was a holiday, sick day or some other mandated day off with pay. Instead, all Samoans who were supposed to work that Friday were promised a full day’s pay for December 30, 2100, because the government officially declared the day not to be a day, as it struck that date from the calendar, expunging it from the past and future historical record, like troublesome “unpersons” in the former Soviet Union, who reportedly did not merely or always cease to exist, but who officially never existed in the first place. Similarly, Samoa has decreed that 12/30/2011 never existed, never happened and never will—sealing its fate as what I’ll call an “un-day”, on analogy with “unperson”, “unbelievable” and “undone”, not with “UN Day” (United Nations Day), unless you feel that any day genuinely uniting all nations also has never existed and never will (in which case, the day becomes “un-UN Day day”—“un-UN Day”, for short). An un-day is also not to be confused with an Alice-in-Wonderland “unbirthday”, which is a birthday that is celebrated late (or possibly early) on a non-birthday day (a fabulous precedent and ploy for those times you have perilously forgotten an important birthday). Being real days, unbirthdays do not meet the criterion for being an un-day. Samoa deleted 12/30/2011 because it was annoying: Being one day behind its increasingly important trading partners east of the date line complicated and confused business, cultural and personal relationships. The lag desynchronized key events—including collective ones such as New Year’s celebrations, personal ones like birthdays and strategic ones, such as Samoa Saturday/China Sunday business calls and conferences (when, for example, a Samoan office might be open, but the Chinese counterpart might be closed). Situated virtually on top of the date line (20 miles east of it) that divides one day from the next, Samoa reversed its 1832 decision to synchronize its calendar with that of the economically dominant West and to revert to alignment with the currently ascendant East, so that when the sun rose on December 31st in Beijing (and all of China, New Zealand and Australia), it was suddenly also December 31, 2011 in Samoa, rather than the pre-decree calendar date of December 30th. No longer will independent Samoa be, like the United States and American Samoa, one day behind China and the other nations east of the date line. 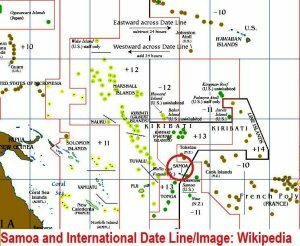 The Samoans are changing maps, charts and atlases to align with Samoa’s new date line position. Humor intended or not, a postage stamp, bearing the phrase “into the future,” has also been designed to commemorate the switch. Since being paid not only not to work, but for days that have never existed is great work if you can’t get it, so to speak, the question is, seeing how the Samoans got so lucky, how can we get lucky like that too? My suggestion: Without announcing it much in advance, other governments could try randomly eliminating any given December 31st, thereby creating an abrupt transition from the old year to the new one, without the predictable New Year’s Eve drunken parties, DUI arrests, hangovers, couples’ break-ups, overeating and gastric distress, and bar fights. The gains in productivity, health and morale on the first day back at work would more than justify the decree. Are Samoans Now a Day Older, or Younger? Equally pressing is the question why the Samoan government would do such an outrageous and unexpected thing that is in the same league as legally changing one’s age—which, by the way and on one interpretation, is exactly what the elimination of a day in the year does for all Samoans, since it makes every one of them legally a day younger than they would otherwise be (in the absence of corrective legislation to address that age change). By removing one day from the year, the Samoan government assures that each of the 186,000 Samoans will have lived only 364 days in 2011, rather than the expected 365. Hence, they are all one day younger than they would have otherwise been. Or does the decree actually make them a day older, since, when they woke up on December 31st, it should have been December 30th? When Rip Van Winkle woke up after his long slumber, he was as old as whatever the calendar implied, whether or not he had any memory of the time lost while asleep. It stands to reason that another decree or two about the age of Samoans and Samoa is likely to follow soon. My guess—They’ll all be declared a day younger, to help the government delay eventual first-time pension payments by one day, to offset the cost of the December 30th holi(un)day pay. Entertaining ramifications of the expunged day aside, there is a sober and sizable cost associated with the official obliteration of December 30, 2011—all those wages that have to be paid by someone, on top of which there is the one-day decline in national productivity statistics the wage freebie implies and its impact on GDP. However, whatever the costs of losing a day, they may pale in comparison with those possibly associated with the much bigger picture and time frame: the prospect of losing more of this century’s business to China, Australia and New Zealand.